Kangaroo ePump™ pump sets are DEHP-Free and incorporate the Anti-Free Flow safety feature. We have been using the Kendall spike screw safety feed set w/1000 flush bag for years. The last shipment had the NEW ENFit connections w/a temporary adaptor to fit the existing systems. 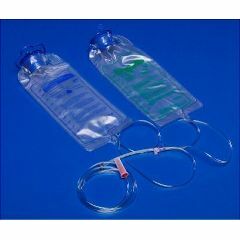 Can anyone supply the NEW Patient Feeding Tube with the ENFit connections NOW. Covidien say will be available 1st Qtr.2016. Present temporary connections are difficult. Can I use the kangaroo feeding bag ref #773656 instead of ref #763656 feeding bag ? I have a Joey Kangaroo pump but not the Kangaroo Joey ePump. I wanted to have the dual flush but have one feeding line to the Kangaroo Joey pump. Can I use the Kangaroo ePump 1000ml feed set with 1000 ml slush set for my pump?